It is one of the largest productions on tour with a cast of 38, orchestra of 15 and a technical team of 32 who bring the show to life 8 times a week. It takes sixteen 45-foot trailers to move the production from one venue to the next. The show finishes in one venue on the Saturday night and opens in the next venue on the Wednesday, just 4 days later. Over 100 people are involved in transferring the show and the team work around the clock to make it possible. • 38 adult cast members, from 10 nationalities including British, Filipino, Thai, Chinese, Korean and Japanese, Singaporian, Swedish, Dutch and Malaysian. • The backstage team includes 1 Company Manager, 1 Assistant Company Manager, 5 Stage Management, 1 Retail Manager, 6 Stage Crew, 4 Flymen, 5 Follow-Spot Operators, 3 Touring Carpenters, 3 Automation Operators, 4 Sound Operators, 3 Touring Electricians, 9 Dressers, 4 Wigs Personnel, and 5 Wardrobe Personnel. • 2 touring chaperones (for the children playing ‘Tam’) and a touring physiotherapist. • 15 members of the orchestra, plus a Musical Director. • The show tours with a Resident Director to make sure the show’s artistic standards are maintained. • The team does 104 loads of washing per week. • 4 washing machines, 4 tumble driers, 2 ironing boards and 4 steam generator irons and 3 hot drying cabinets tour with the production. • All the straw hats in the show are from Vietnam or Thailand. • There are over 200 pairs of shoes in the show. • The bikinis worn by the girls in the American Dream number have a kilo of beads on each one. • There are 16 costume changes for each member of the female ensemble throughout the show. • The G.I. boys’ flak jackets and helmets are all original and have been used in military action. • Every piece of costume has a hand sewn label with the actor’s name, scene and character. • There are 60 wigs in the show. • All the wigs are made from real hair and have lace fronts. • The character of ‘Kim’ has 7 hair style changes throughout the show and the actress uses her own hair for this. • 5184 individual LEDs light the backdrops on a 12 metre by 9 metre LED wall. • There are 1437 lighting and video cues in the show, of which nearly 600 are called by the Deputy Stage Manager, 5 of them are triggered by sound effects. • There are 136 moving lights in the lighting rig which move to over 6000 positions throughout the show. • 16 smoke machines and 12 fans create the atmosphere in the show, 6 of which come through tiny holes in the show floor to allow haze to appear in accurate places. • The video elements in the show come from 2 of the latest laser technology projectors on the front of the Dress Circle. • There are 5 follow-spots on the show, 3 right at the back of the auditorium and 2 that are just behind the proscenium which the operators have to be in a harnesses to climb up to. The operators are incredibly busy in the show with over 580 different cues to follow the cast around. Some of these cues are so subtle that it’s hard to even know how they’re being lit, not an easy thing to achieve! • This tour has more lighting elements than the Broadway and London versions of the show. • The Stage Management team is made up of 1 Stage Manager, 1 Deputy Stage Manager and 4 Assistant Stage Managers. • There is one Assistant Stage Manager running each wing on stage. The Deputy Stage Manager sits at the prompt desk and gives all of the cues to Lighting, Sound, Automation and Stage Management. The Stage Manager is present on stage to ensure the smooth running of the show and to help solve problems if and when they might arise. • There are 600 props used in the show. Each prop has to be accounted for before each performance. This is carried out by the Assistant Stage Managers using a check sheet. • Anyone who is backstage/in the wings during a show has to wear Black clothing in order not to be seen by the audience while doing their cues. • When the show moves to a new theatre each prop has to be carefully wrapped in bubble wrap to avoid any breakages en route. • The Stage Manager writes a report after every single performance with details about that show. This contains information such as anything that went wrong in the show and also if there were any understudies performing that night. • There are 15 members of the orchestra. • Instruments include 8 Asian flutes, piccolo and flute. • The Asian flutes (Dizi) only play when Kim is on stage and act as her character within the Orchestra. • There are 77 different percussion instruments in total. Unusual instruments include skull drums, ankle bells, singing bowls, Thai chap cymbals and kabuki blocks. • There are 2 percussion players, both in separate booths and surrounded 360 degrees by instruments and 28 separate microphones. • During the show 2 Radio Engineers are needed backstage to monitor and look after all the sound equipment and the radio mics on the cast. • The show is operated from the auditorium by the operator who controls the band and individually mixes each line of the show. • There are 42 radio microphones worn by the cast. These are hidden in hair, wigs and even hats. • There are 44 AA batteries used per show. These are all rechargeable batteries and there are 3 sets of batteries that are constantly being cycled. • There are 43 mics in the orchestra pit, 28 of them are in the percussion booth. 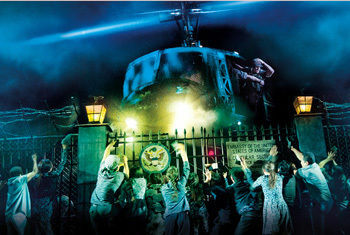 • Miss Saigon tours and installs a full surround system. There are around 170 speakers front of house. • There are 65 speakers on stage and in the pit providing foldback to the cast and band. • There are specific speakers overhead, on stage and on the helicopter itself to provide the audio effect of the helicopter flight. • There are around 40 video monitors on the show, giving performers a view of the conductor and stage management and crew views of the stage during the performance. • There are 38 wireless communication devices used on the show so all departments can communicate and follow cues during the show. • In an 8 show week the Helicopter rotor blades spin approximately 3600 times. • The blade span of the helicopter at full extension is 2.6 metres. • It has 10 different moving elements, independently controlled. • It weighs over 3 tons. • At full height it’s the same as 1.5 London double decker buses. • There are over 35 feedback functions on board. • By the end of the tour, the helicopter will have travelled an Olympic running track over 50 times, that’s over 20,000 metres! • has been performed in 32 countries. • in 15 different languages. • and has won over 70 awards including 2 Olivier Awards, 3 Tony Awards, and 4 Drama Desk Awards. • It has now been seen by over 36 million people worldwide.